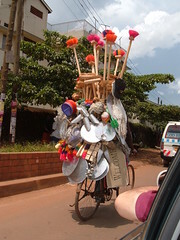 We've done a fair bit of driving around Kampala today, what with needing to buy some wireless routers to take to Karamoja, plus visiting various sights and markets. When I say driving, I fortunately mean "being driven", as for a Westerner, the traffic is a nightmare! From what the others say though, Kampala is fairly typical of a large, 3rd-world city: busy, noisy, smelly and lots and lots of bikes and scooters. The only rule road-users seem to follow is keep to the left, though this does not stop over/under-taking at any opportunity! What's surprised me about my visit so far is how normal everything seems. I was expecting to feel huge culture shock, both from being an ethnic minority and also due to the poverty. Both are very, very present, and the poverty saddens me, but I think I have yet to see it at its worst. I think that this has been tempered also by the seemingly even spread of poverty across the city: everywhere we go, we see people begging, selling things or otherwise impoverished, and yet right next to them will be someone in a suit, or a smart car, or even a private tennis court! We were also treated to a view of Uganda's Prime Minister today! His convoy of a pickup, loaded with bored, but armed soldiers, followed by his chauffeur-driven Merc honked past us. We decided not to take any pictures though, having been warned by a traffic police-woman earlier in the day that taking photos without prior permission was not allowed (even from a car)!